The BTP History Group have now completed the project of scanning all the 157 Journals and making them available in PDF format on disc. Those that took part in the initial fund-raising exercise and donated £20 or more should have received their DVD set. 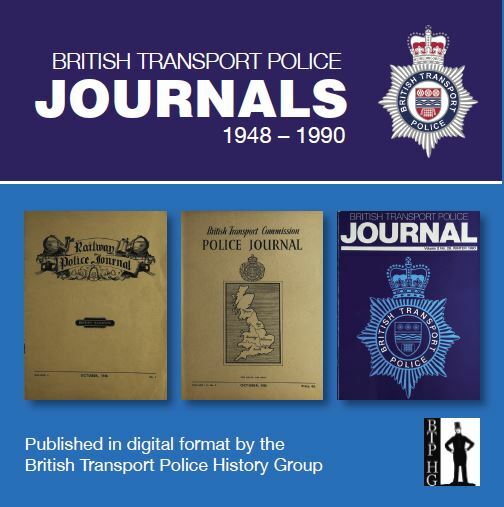 These discs contain digitised versions of all Journals originally published as the Railway Police Journal, the British Transport Commission Police Journal and the British Transport Police Journal. They represent the evolution of the Force from its inception in 1947 following the Nationalisation of Britain’s railways. Each of the ‘Big Four’ railway companies; Great Western, London Midland & Scottish, London & North Eastern and Southern had their own Police Departments which were initially amalgamated into a Railway Executive Police. The role of the police subsequently expanded to encompass all the many and varied activities under the control of the British Transport Commission. These included the railways, docks, waterways, road services and eventually, the London Transport organisation. From 1948, the Journals were produced quarterly by the Force under the Editorial control of a variety of senior officers. Apart from articles of general interest to Police, such as new legislation, there was staff news including promotions and retirements, and Obituaries. Police staff were encouraged to relate their experiences of their particular work, whether on the railways, docks or London Transport. There was a regular feature on news and events from the Training School at Tadworth and photographs of training Courses and presentations. Sports and Social activities, First Aid, and historical matters all helped to add to the diversity of information to be found in these pages. The journals are supplied on two DVD-ROMs, comprising 157 quarterly issues. You can view all of the magazines on-screen and print out individual pages. Each volume is word-searchable. The British Transport Police History Group acknowledges the contributions made by The British Transport Police Property Fund, The British Transport Police Federation Lottery Fund, 13 History Group members who donated £50 or more, 49 History Group Members as well as numerous other donations made through the website, without whose generosity this project would not have been possible.